This fierce prophetic symbol, as most protestant Bible scholars have believed, represents the Roman Catholic church organization. The description found in Revelation 13 matches the papacy in every detail. In chapter 13 (verses 1-10) is described another beast, "like unto a leopard," to which the dragon gave "his power, and his seat, and great authority." This symbol, as most Protestants have believed, represents the papacy, which succeeded to the power and seat and authority once held by the ancient Roman empire. 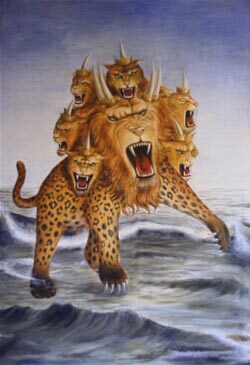 Of the leopardlike beast it is declared: "There was given unto him a mouth speaking great things and blasphemies. . . . And he opened his mouth in blasphemy against God, to blaspheme His name, and His tabernacle, and them that dwell in heaven. And it was given unto him to make war with the saints, and to overcome them: and power was given him over all kindreds, and tongues, and nations." This prophecy, which is nearly identical with the description of the little horn of Daniel 7, unquestionably points to the papacy. Click Here to watch a video about the number 666 at YouTube.